With the US Dollar at a crossroads ahead of policy meetings it was another interesting day for the euro vs dollar currency pair, which initially threatened to recover all the lost ground of Friday, only to fall back exhausted in later trading, as it ended the day with a narrow spread up candle, but one with a deep lower wick to the upper body, suggesting that the bears were in control late in the day. Indeed technically we now have a short term bearish signal with the high of the day meeting resistance from the 9 day moving average, and the bearish flavour further reinforced by the crossing of the 9 day and 14 day moving averages. On the positive side of the equation, the close of the session closed marginally above the 40 day moving average which seems to be offering a degree of support at this price level, so a slightly mixed picture at present. 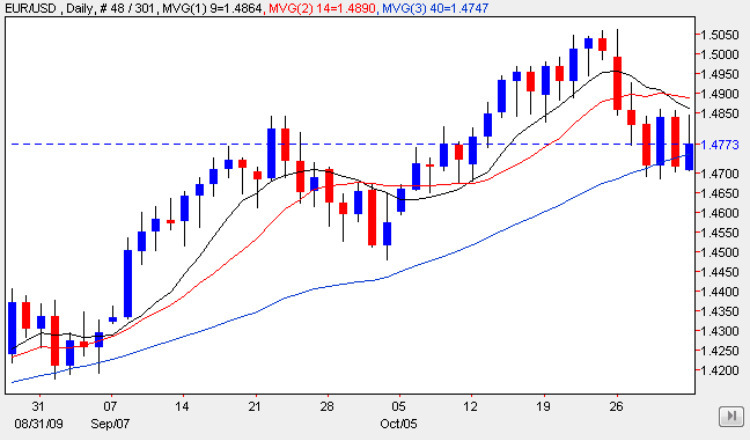 The key to the short and indeed medium term will be whether the floor of support now being created in the 1.47 region is sufficient to provide the paltform for a recovery and move higher, and if so then we should see a restest of the recent high of 1.50 with a continuation of the recent bull trend. However, should this level fail to hold then we may see a test of the support possibly as low as the 1.4450 region in due course. All of this technical analayis must ofcourse been seen against the backdrop of this week’s key fundametnal news items with the FOMC meeting concluding tomorrow with the accompayinging statement, followed by the ECB equivelanet on Thursday and topped off with NFP on Friday. All these events could have a dramatic and lasting effect on the euro vs dollar pair, and in particular any change in sentiment to the US dollar as a result, so trading this week should be based on extreme caution and tight stop loss management. With no significant item of fundamental news on the economic calendar for either Europe or the US markets are simply waiting for the FED and ECB and looking to equities for confirmation (or otherwise) that the recent global recovery is sustainable in the short to medium term. You can keep up to date with all the latest fundamental news on the economic calendar, latest currency news and live currency charts by simply following the links. I have also included details on an excellent ECN broker.